Blockbuster fights, in both boxing and MMA worlds, rarely live up to the expected hype and hyperbole spouted in the lead-up. Anthony Joshua vs. Wladimir Klitschko was one of the few exceptions: back-and-forth knockdowns, devastating combinations and gutsy, embattled grit was on display for all to see in a heavyweight championship bout which saw Joshua pick up an 11th-round TKO win after finally tasting adversity in his flourishing career. After such an enthralling fight and its subsequent fallout—and despite his best vocal efforts—it’s easy to overlook the man who was the previous proud owner of the WBA and IBO world titles fought over by Joshua and Klitschko: Tyson Fury. Fury had won those two titles, along with the WBO and Joshua’s IBF championship, against Klitschko in a comprehensive decision victory as 2015 came to a close. 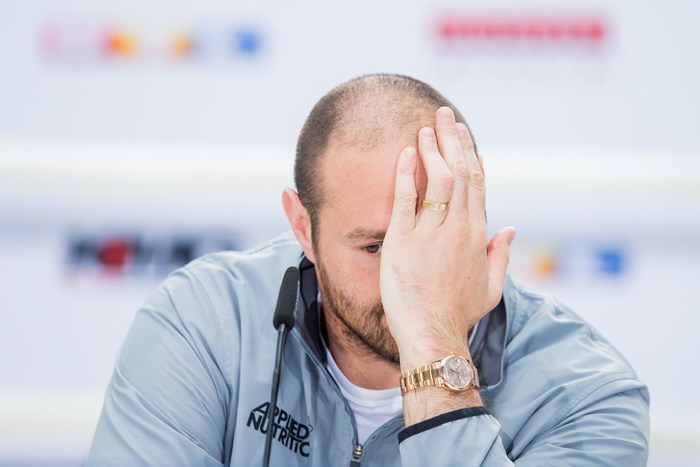 But, citing mental health issues and an alleged failed drug test for cocaine, Fury’s scheduled rematch against Klitschko was cancelled in 2016 and the “Gypsy King” relinquished his belts and had his boxing license suspended by the British Boxing Board of Control (BBBofC). Losing his world heavyweight titles, only for long-running rivals such as Joshua to snaffle them up in his absence, and his ability to box—as well as ballooning up in weight to 350lbs—Fury admittedly had a “nightmare” of a year in 2016 like so many others. 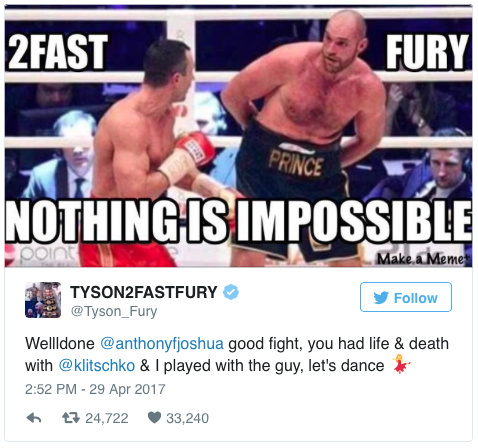 Despite all of this, Fury was never out of the picture during the lead-up to Joshua and Klitschko thanks to his history with both men and innate ability to get under the skin of his pugilistic colleagues—even prodding “AJ” enough to prompt an insulting Twitter retort which is wholly uncharacteristic of the usually ice-cool Briton. Fury successfully managed to manoeuvre a sizeable portion of the attention garnered by Joshua and Klitschko unto himself. Fury didn’t accept Joshua’s generous offer of ringside seats, but his inexplicable absence from London’s Wembley Stadium snatched further fight focus, leading Joshua to call out his British rival in another move not generally befitting his charming, unconfrontational demeanour. It doesn’t take much, but Fury is clearly emboldened by the trouble Klitschko posed for Joshua. It wasn’t pretty, but Fury left the ring relatively unscathed in his victory over the Ukrainian—ending Klitschko’s decade of heavyweight dominance in the process. Equally, Joshua is by far the biggest fight Fury could hope for at this stage. Fury had good reason to not be in attendance on Saturday night. Now self-styled as Tyson “2 Fast” Fury—a clear jab at both Joshua in reference to his cleaner performance against Klitschko—Fury has embarked on his first training camp since 2016, joining fellow traveller Billie Joe Saunders in Marbella, Spain, posting footage of his progress and keeping fans informed of his weight loss. In this age of constant misinformation, Fury already claimed he would be returning to the ring this month, but the BBBofC quickly dismissed any ideas of this back in March. A week ago, before what went down in London, Fury said he was targeting a comeback fight on 8th July in an undercard bout as Saunders takes on Georgian Avtandil Khurtsidze for the former’s WBO middleweight title in the main event. Like before, the BBBofC would expect Fury to appear before the board before being given permission to fight and have the suspension of his boxing license lifted. A hearing has now been scheduled for next week. Just a week on and still nowhere near his optimal fighting weight without a full training camp dedicated to him in its entirety, Fury—rightly or wrongly—smells blood and wants Joshua as soon as possible and without a warm-up fight in between. “Styles do make fights, but I am sure I can beat AJ with one arm tied behind my back,” Fury told Sky Sports. “I don't even need a warm-up if he wants this. I have been out of the ring as long as Klitschko but the difference is, I am not 41, I am 28. "There's only one fight out there, the biggest fight in the world and everyone knows that. It is the heavyweights, it is me and AJ, no one else. It is the only one the world wants to see and I am here, I am the lineal champion, I am still No. 1 in the world and everybody knows that. We all saw [his career] had a life and death situation against Klitschko, but Klitschko couldn't land a glove on me. It’s unclear what is next for Joshua with a Klitschko rematch and names such as Kubrat Pulev—his IBF mandatory challenger—Luis Ortiz, Joseph Parker and Deontay Wilder in the offing alongside Fury. AJ’s promoter, Eddie Hearn, says Joshua is “desperate” for the Fury fight, but how unlikely it was thanks to Fury’s “terrible” physical condition at present. But then it’s hard to decipher whether Hearn is just taking a shot at Fury as there’s certainly no love lost between the two. No matter Joshua’s next opponent, his next fight will be big business in the United Kingdom and beyond as the world stood up and took notice of his stirring Klitschko victory. But with both Joshua and Fury thinking they’d easily beat the other, their history of words and markedly different victories over Klitschko, there is no doubting Fury is the most attractive proposition as Joshua’s next title defence. Fury may not be classically media trained nor the most eloquent with his penchant for offence, but he certainly has the natural nous to keep his name relevant in the world of boxing.